Kenya's Rugby Sevens team -Shujaa- started their Hong Kong series with a perfect win over Canada as the World Rugby Sevens Series continues. 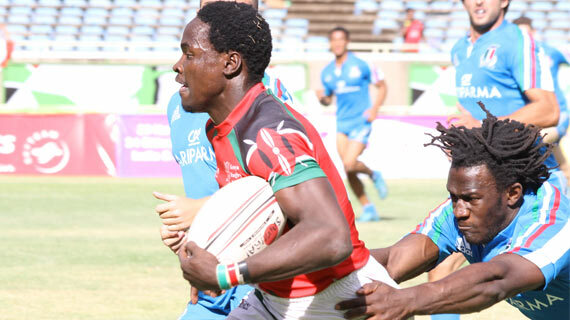 Five tries, four of which were converted earned Kenya their highest win over Canada in the World Rugby Sevens Series, the second Pool B match at the Hong Kong Sevens on Friday afternoon ending 33-10 in favor of Shujaa. Willy Ambaka who has been immense this season entered the centurion club only inhabited by Collins Injera and his elder brother Humphrey Kayange scoring one of the tries to move to 100 in his sevens career. Sammy Oliech, Andrew Amonde, Collins Injera and Nelson Oyoo contributed the other tries. Canada were the first to cross over the chalk through Connor Braid who dotted down on the left. Shujaa though responded immediately, Sammy Oliech making the most of poor handling by Canada off the restart to sprint away and dot down on the right. The burly Amonde added Kenya’s second try finishing off a well calculated move after Injera had started a penalty quick before the Canadians could re-organize. Oliech booted home the conversion for a 12-5 half time lead. Shujaa were reduced to six men after Nelson Oyoo was sent to the sin bin and Canada made most of it, dotting down their second try of the game after Harry Jones offloaded a line out quick to Pat Kay. But Kenya were not shaken with Injera crossing for the 251st time in his career in superb fashion, a sweet dummy off a Billy Odhiambo offload setting him free to run under the posts. The conversion was good as Kenya went 19-10 up. Ambaka then turned up for his 100th career try blazing his way under the posts much thanks to work from Oyoo who ran on the left and pulled away two Canadians with him. Oyoo capped off the wonderful evening for Kenya with a fearless run down the middle, as Eden Agero added in the twos, Kenya enjoying a blistering start. Shujaa will next play Spain at 8:10am on Saturday morning before finishing off their group campaign against Australia at 12:10pm.